New emotional-based AI is a step forward in using robotic tutors in primary school classrooms. Robotics has attracted great interest among teachers and researchers as a valuable tool for developing cognitive and social skills of students, from kindergarten to middle-level education, supporting science, mathematics, technology, computing, and other subjects as well as interdisciplinary learning activities. In addition, it has been shown that the implementation of social support behaviours in robot tutors increases efficiency in student learning. Now, a study from researchers at the Department of Artificial Intelligence develops an integrated computational architecture for use with software applications in schools, bringing the use of robotic tutors in primary school classrooms one step closer. The team state that the main goal of their work was to design a system that can detect the emotional state of primary school children interacting with educational software, and make pedagogic interventions with a robot tutor that can ultimately improve the learning experience. The opensource study is published in the journal Frontiers in Computational Neuroscience. Previous studies show that online educational resources are becoming increasingly common in the classroom, although they have not taken into sufficient account that the learning ability of primary school children is particularly sensitive to their emotional state. It has been hypothesized that this is perhaps where robot tutors can step in to assist teachers. 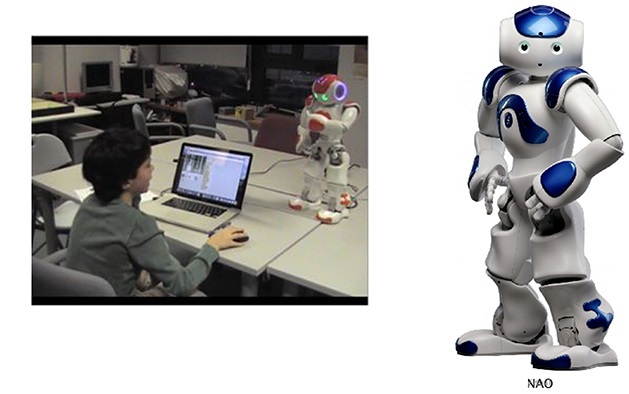 The current study develops a robotic tutor platform, MONICA, which integrates the educational software Scratch to a commercially available robot through computational architecture. The current study first identified three cognitive states, concentrating, distracted and inactive, which are known to influence the course of learning. Keyboard strokes and mouse actions of children using educational software were used to predict which of these cognitive states the child is experiencing and subsequently linked to an algorithm that chooses the correct form of pedagogic intervention. These could be words or gestures of encouragement, or attempts to raise interest and motivation for a specific learning objective, all of which can be delivered by a robot tutor. The lab state their first prototype was designed to demonstrate that the architecture works in detecting simplified emotional states. They go on to add, however, that it seems robot tutors are not ready to replace school teachers just yet. They conclude that robot tutors could have an effective support role to play in the primary school classroom in helping children reach their specific learning objectives. The team surmise that their study demonstrates the feasibility of a general-purpose architecture of decoupled components, in which a wide range of educational software and robot tutors can be integrated, and then used according to different educational criteria. For the future, the researchers state that the next step will be to implement methods for detecting a more complex range of emotions with cameras and microphones, and to test the longer term impact of robot tutors on children’s learning curves. Frame of the tutoring experience of the student with low motivation and high competence. Reproduced with permission from the parents of the children. Credit: Luis-Eduardo Imbernon Cuadrado, SOPRA Steria, Madrid, Spain.